Rajasthan Public Service Commission (RPSC), Ajmer has declared Result for Rajasthan Admin. 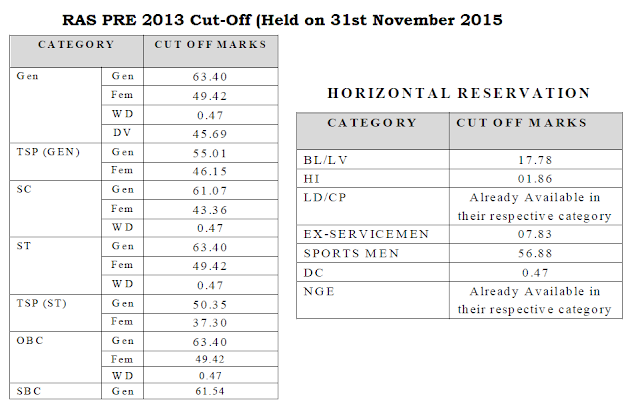 Services (RAS) Combined Competitive Prelims Examination 2013 held on 31st October 2015. RAS Pre 2013 re-examination was held on 31st October 2015 at all district headquarters and major cities of Rajasthan. Ras Mains 2013 will be held on 25, 26, 27, 28th November 2016 with 24079 candidates qualified for RAS Mains examination 2013. Check RAS Pre Exam 2013 Results 2015. RAS PRE 2013 Cut-Off Marks with Categories held on 31 October 2015.